From two weeks on off rain. I didn't wear my shorts, regretted only taking two pairs of trousers and was jolly glad to have a little pully and a cosy sweat shirt jacket. Where have I been? Why, the UK of course. We enjoyed a fairly typical British summer. It could have been worse - we were not camping so didn't get flooded out or suffer from permanently damp clothes. Actually we spent just over a week near London and then a week in Mumbles, Gower where we rented a rather fab house that had a hot tub. My mother and I sipped luxuriously on our G&Ts in a threatening drizzle warmed by the 34°C bubbling water while my brother broke his back tending a barbecue on the floor. We used it once, but made up for the other damp evenings enjoying locally caught fresh fish, salt-marsh lamb from up the road and some classic British chips from the chippy. I was ecstatic when my TWDB was able to come over for the first weekend in Wales, and he got to see Wales in the rain, Wales with murky grey sky, Wales in some sunshine, and Wales in a howling gale. Added to that some laverbread fried up with Welsh bacon, and cockles and I can safely say that he'll remember his little holiday for a very long time! His last lunch was taken at Langland Bay in the Brasserie at the far end of the beach. It's quite new and makes a nice alternative to take-away chips or burgers in a caff. We went for the light lunch because one sight of the fish and chip plate and our stomachs told us No Way! So he had fishcakes which he liked very much, and I had a very original gratin of cockles and laverbread which was yummy. 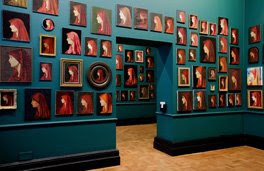 In London, I took the boys to see the Fabiola exhibition at the National Portrait Gallery put together by Francis Alÿs. It's a lovely collection of portraits from different artists - mostly amateur - who all painted the same thing in the same way. He picked them up in flea markets and antique shops all over the place and it's amazing how the copying has been done so faithfully. The original is long gone, apparently. It's now nose back to grindstone time but minus the boys. I'm thus using my time as wisely or as flippantly as I choose. So far I've thrown a whole load of stuff out of kitchen cupboards and brought in the heavy mob - bleach to clean it all up. And now the sun is over the yard-arm and it's apero time.